Catapults, really? 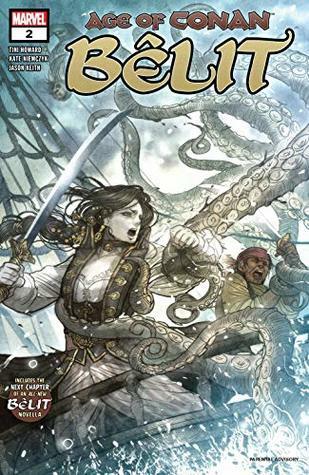 Age of Conan: Belit, Queen of the Black Coast launched the third of Marvel's near-simultaneous Conan comics. Belit-issue one was marred with a nonsensical mercy killing. Issue 2 did little to steer the wreckage. Some pieces of appealing design were thrown in, but the execution was lacking. Belit demonstrates a love of her father's ships, and a desire to be a pirate queen. The details are missing. We are not shown her attachment to the ship, nor are we really given any hint of how she plans to become a queen of the seas. Also, there are hints of her having a connection to sea-creatures, perhaps even summoning them, which would have been welcome, but was squashed. The best part of this issue is Stackpole's 3-page, novelette serial: "Bone Whispers." It's a great extension from the introduction and is a great companion piece regarding Belit. But the comic is main draw, and we are treated to another meandering story of teen-aged brat and a "WTF moment" during a key conflict: catapults on pirate ship. Yep. You might be thinking "hey, aren't catapults siege engines used on land?" and you would be correct. Some historians might say "they were on used ships, but usually war barges, since sails would interfere with the ammunition." Here, Belit has catapults attack her friend?/nemesis sea-creature, a leviathan (a kraken with tentacles). You would hope that the artist or writer would realize how dumb this is. Would have rather seen Belit dive in the sea and wrestle the giant squid. Instead, I gazed a panel that literally has a catapult shooting rocks through a sail. For a series that strives to make connections with pirate-loving, seafaring adventurers, you'd hope they would have applied a ballista, or a Greek-fire spewing canon. Then we have a glint of hope: Belit and her pirate buddies decide to use the carcass to exploit a random port, to convince them that protection is needed and they require money for that. Turns out the port (one of many) happens to be the one that can controls/summon more of the sea creatures. WTH. There is no foreshadowing of the importance of this port, or that a sorceress may be controlling the sea creatures... in fact, this shift takes away from Belit having a special connection to the rare creatures. It would have made more sense if Belit had summoned more (even accidentally). This is pitched as a 5 part series, and there is no clear conflict/story-arc guiding episode #3 (in the comic anyway, the "Bone Whispers" story on the other hand is building tension and hope just fine). What can we expect? Well, at least one absurd panel.